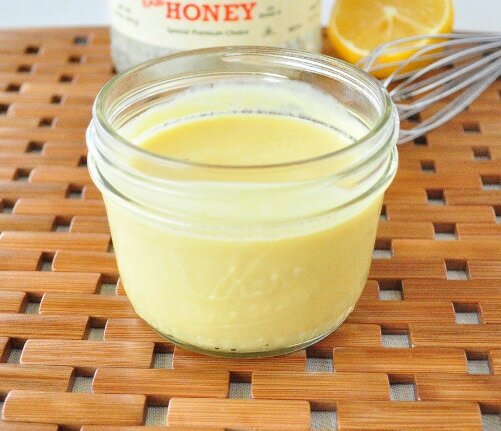 Healthy Honey Mustard Dressing. You have to try it! My kids will eat almost any veggie in honey mustard dressing. Can you relate? Same goes for ranch dressing. I like to make my own with real ingredients so I know exactly what is going into their mouths. Plus, it’s super easy to make your own salad dressing. You probably already have all the ingredients on hand to make this healthy dressing recipe! If you wanted to keep this dressing completely vegan, you can use maple syrup instead of honey, and a non-dairy yogurt. I have done that and it’s works just as well. I like to make this order rather than make a large batch. You can really do it either way, though. For a larger batch, I suggest doubling the recipe. Whisk all the ingredients in a bowl. Serve immediately or store in the fridge for later. I keep mine in recycled glass jam jars. It should last about a week. Super easy, right? Instead of using Greek yogurt, do you think coconut milk or something else could be substituted? You can use vaganaise or coconut yogurt. Had some of this today. I was looking for something sweet to counteract the insanely (almost inedible for me) strong taste of the OrganicGirl pepper greens salad I had. I put more dressing on there than I normally would and it did an okay job. It's pretty good on its own. Not quite what I remember of honey mustard (probably because it's less sweet due to being a healthy version! lol), but it's still pretty good. I think I'll experiment with other kinds of mustard in the future. :) Thanks for the recipe! First time I've used Greek yogurt to make a dressing. Sounds yummy , I didn't see how many calories are in it ? Oh yay! Glad you liked it. what does "T" stand for tablespoons or Teaspoons? I don't get it. Why is mixing honey and mustard healthy? Doesn't sweeteners disrupt digestion when in main courses? It's much healthier than the store bought stuff with high fructose corn syrup and artificial dyes. Raw honey contains over 5000 enzymes including amylase, a digestive enzyme for carbohydrates. The benefit of ingesting naturally occurring enzymes such as amylase is that it reduces the burden on the body to produce these enzymes itself to digest the food. Not to mention the benefits of yogurt and the healthy bacteria it adds to the digestive system. Are you suggesting dry mustard or, the wet prepared mustard? Hi Linda! The mustard I get at Sprouts only has real ingredients. If you want a homemade one, I bet there are some online. I don't have one myself. I will email you the link to the ebook now.